In 1970s Athens a group of professional burglars plan an emerald heist from the home of a gem collector but the corrupt Greek police inspector Abel Zacharia is on their trail. A young man comes to the rescue of his girlfriend abducted by thieves and brought to Rio. An extravagant adventure ensues. Dr. Paul Simay: She's my sister and we're Russian. 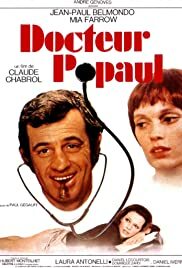 At the time ,Chabrol was producing movies at an alarming speed .And that period is still looked upon as his very best:"la femme infidèle" "le boucher" "que la bête meure" "la rupture" and "les noces rouges" are unqualified musts for any Chabrol fan.Two works took a divergent road in this golden era: "la decade prodigieuse " was a failed (but not completely wretched) attempt at transferring one of Ellery Queen's absorbing books to the screen .And then "Docteur Popaul" which is from Hubert Monteilhet's "meurtres à loisirs" .Monteilhet writes thrillers which sometimes recall Boileau-Narcejac ("Diabolique" "Vertigo" )but he introduces a sense of humor and a certain bad taste not present in the works of the writers I mention above.Chabrol has given a totally true rendering of Monteilhet atmosphere:the set up,the grotesque characters (particularly a made look ugly Mia Farrow :why her anyway?The director had to dub her in French ).The conclusion ,like in any Monteilhet's book, is immoral to a fault.But deliciously immoral.